Protests began in the morning, when people gathered at the Irving Park Brown Line public transit stop to don hospital gowns and canvas the local neighborhood, then assembled at noon for the “Healthcare not Warfare!” action. That protest marched on the house of mayor Rahm Emanuel to protest his closure of half of the city’s public mental health clinics in a ‘cost-saving’ measure protesters say is both unnecessary and part of the city’s push to privatize public services. At the same time, supporters of three men arrested in a Wednesday night raid at the Bridgeport apartment of Occupy Chicago activists were gathering at the Cook County Criminal Courthouse at 26th and California for the arrestees’ noon bail hearing. Each was slapped with a bond of $1.5 million; Cook County States’ Attorney Anita Alvarez had originally asked for $5 million bonds for each, and trotted out a litany of charges deployed in the first-ever use of the state’s anti-terrorism statutes, claiming the Florida residents, Brian Church, Jared Chase and Brent Betterly, were making Molotov cocktails and planned to hit targets that included Obama campaign headquarters and Emanuel’s house. All three men had earlier in the week released a video that documented their targeted harassment by Chicago police, a tape which is said to have enraged local cops. Protesters and attorneys have called the charges ludicrous, pointing out that the ‘bomb-making devices’ police and Alvarez referred to in their post-hearing press conference were actually a home beer brewing operation. of the People’s Law Office. Protesters called on the spot for an emergency protest to begin at 3:30 PM at LaSalle and Jackson, in the heart of the city’s financial district. LaSalle and Jackson has also been the home corner for a months-long Occupy Chicago presence and the staging of several large marches seeking to create an encampment at Congress and Michigan that has been repeatedly thwarted by police and produced hundreds of arrests last year. The 3:30PM emergency protest eventually linked up with a planned evening anti-capitalist march that staged out of the Haymarket memorial and subsequently swelled to thousands, turning into a rolling wave of opposition to the Chicago police department’s sustained effort to thwart anti-NATO protests. The protesters’ goal this week? To ratchet up attention on NATO, the military arm of the 1% -- a cold war relic with a clearly overtly aggressive military mission. NATO missions have killed thousands of civilians in Afghanistan, bombed Libya back into the stone age and allowed its rich oil resources to be steered toward more direct control of western oil companies, and turned a blind eye to the repressive regimes of allies in Bahrain, Egypt, Yemen and other Middle Eastern countries. Member states of NATO, let by the U.S., supported the invasion and occupation of Iraq, leaving that nation in ruins -- and its petroleum resources in the hands of western elites and their allies. City and federal officials and police have worked mightily since the NATO summit was announced last year in tandem with the G8 gathering -- subsequently moved to Camp David by the Obama administration -- to spin their commitment to the right to peacefully protest, to imply that at least some protesters were dangerous radicals and even terrorists, and to position NATO as a benevolent force for good. The city formally pulled the mask off that charade today, when the police unleashed a wave of violence against sometimes rowdy but peaceful protesters as they staged the convergence of the 3:30 and 6:30 marches. Neither action was permitted, in keeping with Occupy Chicago’s standing opposition to the city’s ‘Sit Down & Shut Up” protest ordinances, which were tightened earlier this year to make it virtually impossible to stage permitted actions without at least a million dollars in insurance, massive ‘marshall’ presence, and a commitment to register all signs and banners with the authorities -- draconian restrictions on free speech and civil liberties that the Occupy movement and its allies have refused to embrace. The police used batons, bikes and their fists to beat people and push protesters back repeatedly today, with medics reporting numerous injuries. Several arrests were also reported. One police officer narrowly missed a protester with his baton, inadvertently shattering the billy club against a police bike. By about 9:20 PM, the march had circled back to LaSalle and Jackson, and after the crowd moved off again, a Chicago police van apparently ran over one protester with both sets of the vehicle’s wheels. Streamer Lorenzo Serna passed along information that at least one witness to that injury reports that the driver of the police van gunned the engine before striking and injuring the protester. “I'll respect the law, when it﻿ respects the people,” another protester wrote of the police. Thousands of people watched the day’s actions via livestream via Chicago Indymedia’s livestream channel, and streams by Global Revolution, uneditedcamera, and others. 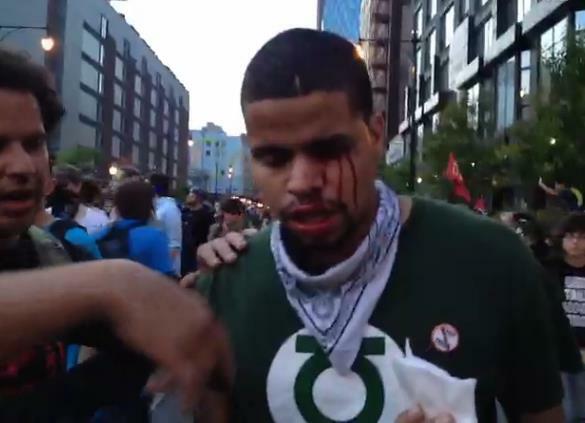 One streamer reported seeing two protesters viciously clubbed by police. “People are very angry at the police,” he said. That anger stems in part from months of demonization of protesters and relentless repression by the authorities of the right to peaceably assemble and utilize public spaces. While much of that repression has been targeted against Occupy protesters, mainstream peace groups have struggled for months to win permits from the city to protest the NATO summit within sight and sound of the gathering -- a goal they have still been denied. Many protesters from out of town said they’d been involved in Occupy efforts in other cities -- the movement nationally has seen a wave of targeted -- and apparently nationally coordinated -- repression by local authorities, despite the movement’s abiding commitment to non-violent protest. Meanwhile, protesters are gearing up for the first full day of the NATO summit, which will include a rally and march being convened by military veterans being organized by Iraq Veterans Against the War and CANG8 -- the Coalition Against the NATO/G8 War & Poverty Agenda. That action will stage out of Grant Park at Columbus and Jackson for a planned march on the NATO summit site at McCormack Place. Protesters at the CANG8 action will hold a 10AM press availability at their press tent at Columbus and Jackson on Sunday to decry the police violence and the criminalization of dissent.